Hello. I'm Lilian Ling, of Mathnasium of Chiswick, your neighbourhood maths-only learning centre. We help children in Years 1 - 12 understand maths by teaching it in a way that makes sense to them. 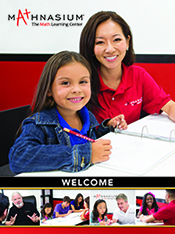 Contact us to book your child's free assessment ! We are very pleased with the service and the engagement in our sons math education. Professional all the way from beginning to end an our son enjoyed the lessons! Thank you Mathnasium Chiswick for a great experience and good results. The CHiswick team is wonderful. They provide instant and regular feedback on the progress my daughter has been making. My daughter’s confidence is growing and she stays motivated to visit Mathnasium regularly. My daughter is really enjoying maths, because team at mathenasium are making a fun for her. Friendly, experienceed and caring Director with very welcoming and helpful tutors. My daughter loves her sessions there and the results are tangible! Thanks to all at the Chiswick Centre! Ella loves going to Mathasium and asks every day after school if she can go along. She has really come on quickly in her maths and become much faster in answering questions.